A GoFundMe has been set up to help the family recover. Less than a month after performing CPR on one of her newborn triplets, Danielle Johnston lost her home after a fire destroyed her farmhouse near Griffin, Saskatchewan on on August 18, 2018. 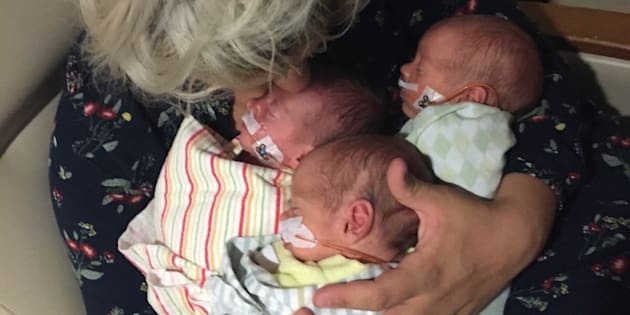 Saskatchewan mom Danielle Johnston made headlines recently when she resuscitated one of her triplets while giving birth to the other two. Her family had been staying in Regina in a camper while the newborns received treatment at a neonatal intensive care unit. The entire family was scheduled to return home next week. That was until Saturday afternoon, when a massive blaze engulfed their farmhouse near Griffin, Sask. They had owned the property since 2010. Johnston said she heard about the fire when her husband, Trevor, received a call from one of their neighbours. "I could hear something in his voice that said he wasn't joking," she told HuffPost Canada. Danielle and Trevor Johnston's three newborns will soon be released from intensive care but the family doesn't have a home after Saturday afternoon's fire. The entire home was burned to the ground along with all of the family's possessions. "It was pretty overwhelming to see everything that you have gone. But at least we weren't in there," Johnston told HuffPost Canada. The family also lost three cats and a dog in the fire. Weyburn Fire Department Chief Simon Almond told CBC News that the house was fully engulfed in flames when his crew responded on Saturday. The home had even more meaning to the family because Johnston gave birth to one of her children in the bathroom, reported CBC. Trevor and Danielle Johnston have seven children together, ages 15 years to one month. "It's gone. It's completely gone. There's nothing," long-time friend Brianna Ereth told the Saskatoon Star-Phoenix. "I don't understand how she's even holding up. It boggles my mind." "Danielle is the most kind-hearted, loving person on the face of the planet. She would give anything to anybody. She's the best mother I've ever met in my life," Ereth told the Star-Phoenix. She's known Johnston since junior high. The Johnstons have been moved by the support they're receiving from their neighbours. "It's overwhelming. Everybody has done so much. Everybody is doing something. Everybody wants to help us," Danielle told HuffPost Canada. Ereth has also set up a GoFundMe to help the family get back of their feet. As of 6:30pm on Sunday, it had raised $22,330 of the $100,000 goal. The funds are meant to help replace items Johnston had accumulated for the triplets including triple strollers and triple high chairs, all of which was lost in the flames, reported the Star-Phoenix. "In an effort to help the family with their needs at this very difficult time, please find it in your heart to give graciously to help get this family back on their feet... all 18 of them!" the description reads. Johnston said she finally had a chance to look at the GoFundMe page on Sunday night and seeing the messages of support and donations has been "humbling." "I just sat there and bawled. So many people are giving to us," she said. 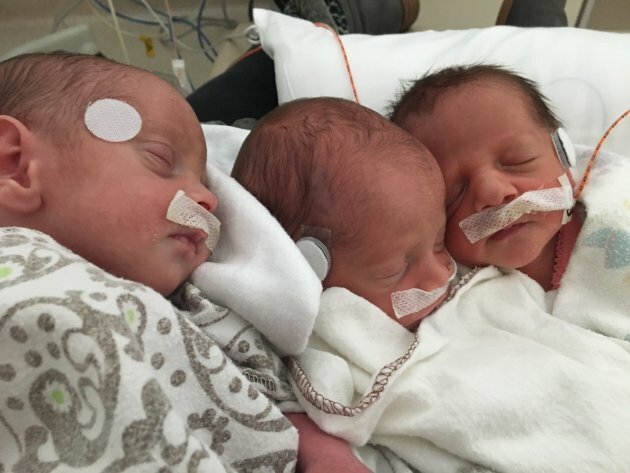 The Johnstons were finally able to leave the hospital with their newborn triplets on Sunday and Danielle praised the staff for helping save her babies. "Those doctors and those nurses in the NICU are a cut above the rest," she said. "They were on ventilation. They were born so young, premature. But now you look at them and they look like regular newborns and they're doing what they're supposed to be doing." A GoFundMe has been set up to help Johnston, her husband and her family recover from a fire that destroyed their farmhouse on August 19, 2018. Danielle knows the family has a lot of work ahead but she's been inspired by the support she's received from her neighbours and the online community. "We're going to rebuild. And continue on. We're going to definitely give back as much as we can in our life," she said. "I'm not a very emotional person but it's not hard to think about all this and get a tear in your eye," she added. "How do you even thank people. Thank you isn't enough."